I’m a huge fan of clean, elegant design, especially when it comes to software you use everyday. Think about apps you use on a daily basis, how many of them do you actually like using because of it’s design. Looking good isn’t the only aspect of design however, usability plays a huge role in design as well. If you had an app that looked great but required you to take more than a few minutes to understand, can it really be considered good design? Rarely do you come across an app that both looks stellar and improves on usability, that’s what makes it even more surprising that something as simple as a calculator application can come under both those categories. 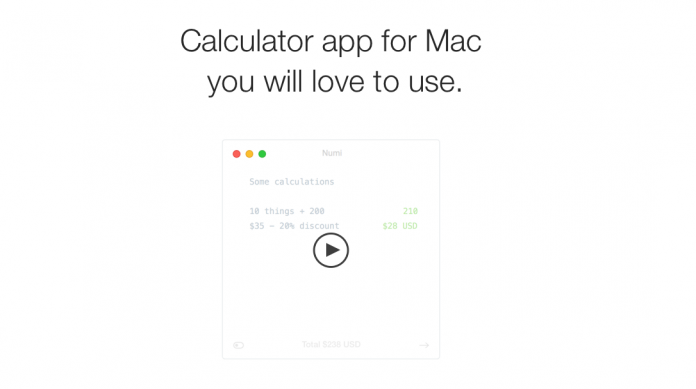 Numi is a calculator application for the Mac that thinks of a calculator application in a new way. Think of the regular calculator app you have on your computer, it looks like an actual calculator. That’s good right? We know how calculators work, which means we automatically understand how to use one. Why does it need to show us the numbers though? We have numbers on our keyboard, why do we have to take up all that space on our screen? Also, what happens when you want to do multiple calculations in a row and see them all. Numi has a way to answer those questions, it’s different, and it works. It works almost like a text editor that calculates anything from units to currency and uses a language processing kind of thing (somewhat similar to Fantastical) to make it easier to do complicated calculations. One thing is for certain, Math class in high school would have been way more fun with Numi.